King Vikramaditya was a great ruler. Each day, a man brought a fruit as a gift for him. One day Vikram dropped the fruit and a diamond fell out. Vikram thanked the man and asked him, what he wanted in return. He asked Vikram to bring Betal, a ghost hanging from a tree in the graveyard. 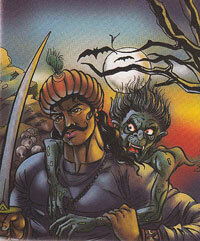 Brave Vikram went to the graveyard and pulled Betal down on to his shoulder. As he started walking back, Betal said, "I will tell you a story and then ask a question. You must tell me the answer otherwise I will break you head. But if you speak I will fly back to the tree." Vikram agreed. This was the start of a series of stories Betal told Vikram, but each time Betal asked Vikram a question, Vikram answered and clever Betal flew back to the tree.